We offer a great selection of string instruments that are perfect for recreating historical music. 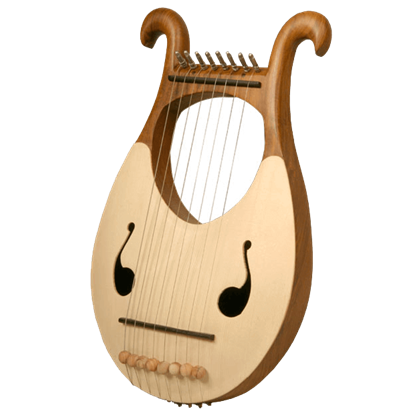 The selection is made up of mainly harps, but we also offer a Renaissance lute, which is pretty easy to learn and comes with a case and instructional book. 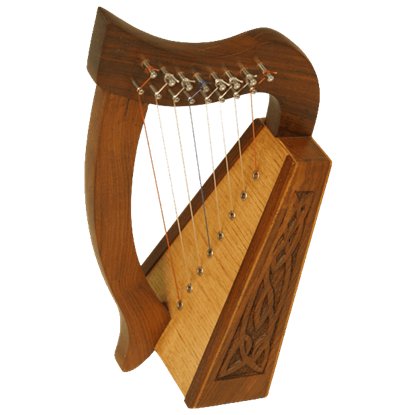 Our harp selection ranges from contemporary styles to Celtic styles with engraved Celtic knotwork. 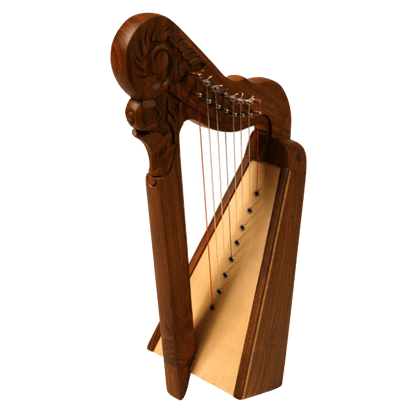 With many sizes to choose from as well, such as our miniature baby harps that are about 15 inches tall to our large floor models that are 51 inches tall, you will find everything in between. 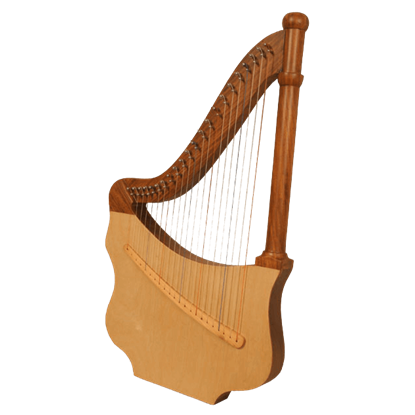 Harps sound beautiful when played solo or in a group setting, making them perfect for Renaissance fair performers, beginners, or even professional harp players. 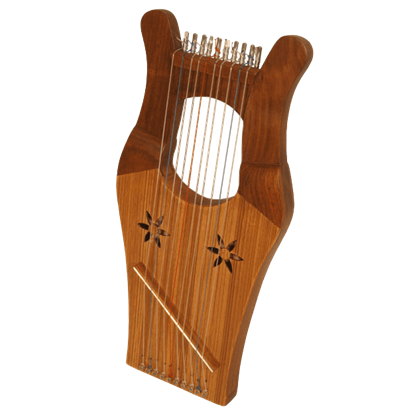 Our Baby Celtic Harp with Knotwork is the perfect size to sit on a small table or rest on your lap while playing. 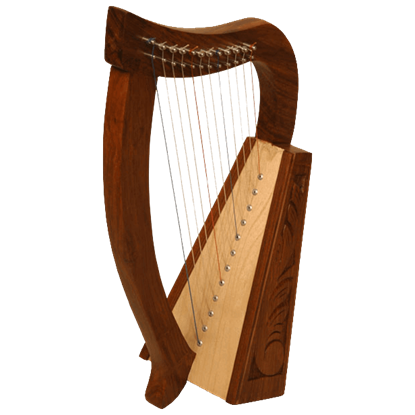 The Baby Harp has an engraved rosewood frame featuring Celtic Knotwork designs with a spruce soundboard. 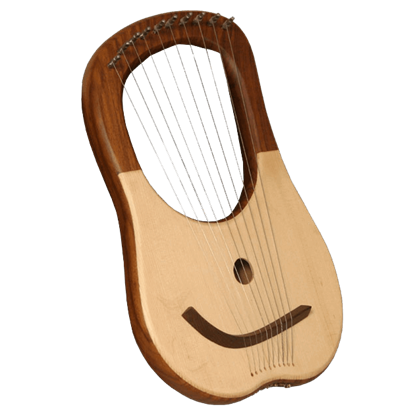 Our Baby Harp is the perfect size to sit on a small table or rest on your lap while playing. It features 12 DuPont hard nylon strings with no sharpening levers. 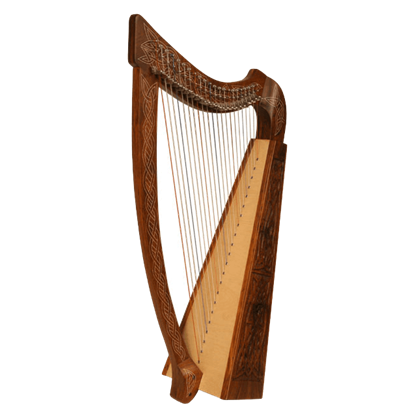 The Baby Harp has an engraved rosewood frame with a spruce soundboard. 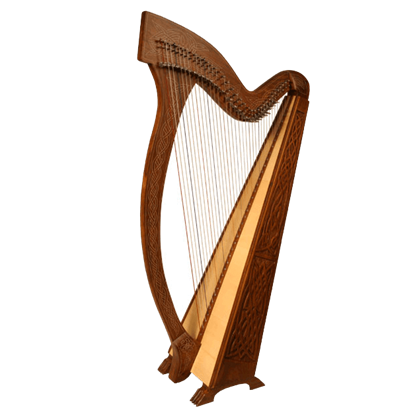 The Heather Harp features Celtic Knotwork that is engraved and inlaid on the rosewood frame and has a plywood soundboard for exceptional sound and strength. It includes a tuning tool and extra string set. Known as a King Davids Harp, our Kinnor Harp is made of Rosewood. 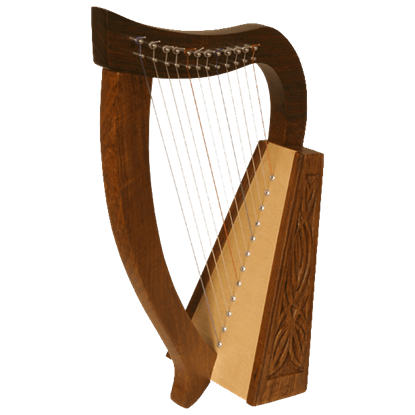 The harp has 10 nylon strings for the biblical scale and comes with a nylon case and tuning tool. It features DuPont hard nylon strings. Our Lily Harp displays knotwork carvings along the frame. It features 8 DuPont hard nylon strings, a range from C above Middle C to High C, no sharpening levers, and a hand-engraved rosewood frame. 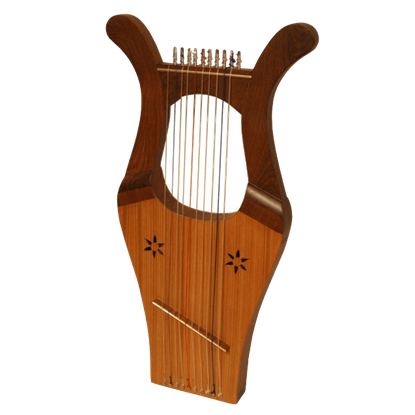 The Lute Harp features a rosewood frame. The strings run from tuning pegs on curved neck to an angled bridge on the soundboard. It includes a tuning tool and nylon case. This Lyre Harp features inlaid arms and stars carved on the soundboard that add to the beauty of this instrument. 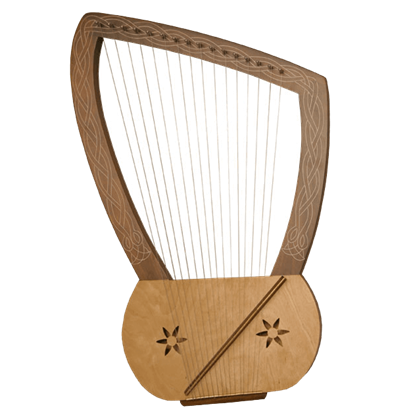 This harp has 16 metal strings. A nylon case and tuning tool are included. The solid rosewood body lends itself to the soft curves of the ten string Lyre Harp. The metal strings provide a classical sound, enhanced by the solid spruce soundboard. When you are not playing, you can hang it up as a piece of art. The solid rosewood body lends itself to the soft curves of the eight string Lyre Harp. The metal strings provide a classical sound, enhanced by the solid spruce soundboard. When you are not playing, you can hang it up as a piece of art. The Meghan Harp features 36 DuPont hard nylon strings, a range from C two octaves below Middle C to C above High C, 31 sharpening levers, a rosewood frame, and a birch soundboard for exceptional sound and strength. Known as a King Davids Harp, our Miniature Kinnor Harp has 10 nylon strings for the biblical scale. It features DuPont hard nylon strings and includes a tuning tool, an extra string set, and nylon carrying or storage case. This Miniature Parisian Harp is a functional harp but is designed to be decorative. It is designed in solid rosewood with a spruce soundboard. The lings of the pillar and curving lines of the arm are joined by the hand carved scroll.